We have added a great looking, rugged, leather bottom to this medium-size, feature-laden shoulder bag. It is part of the straightforward, functional and sleek-lined group of Rainbow Bags—Day Packs, Fanny Packs and Shoulder Bags. 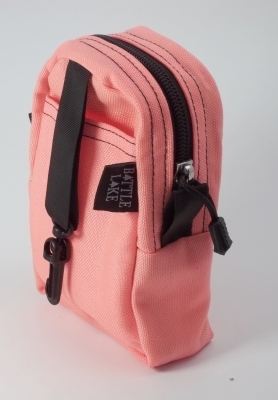 With it’s mid-size capacity you will find a multitude of uses for this everyday bag. There are plenty of pockets, a comfortable shoulder strap and plenty of good looks to make this a can’t-leave-home-without-it bag. Fully-lined, open main compartment. Two open organizer pockets in the main compartment. Flap with adjustable, quick-release, buckle closure to secure the main compartment. An additional 1-1/2” wide hook and loop closure for the flap. Zippered front pocket. Zippered flap pocket. Open back pocket. 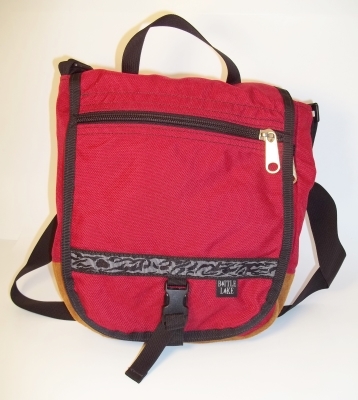 Removable and fully adjustable 1-1/2” wide shoulder strap. Non-slip shoulder pad. Carrying handle. Colorful pattern webbing trim. Durable and good looking leather bottom. Key keeper in the back pocket. Made in the USA of American materials. 1000 Denier Cordura outer. 420 Denier Nylon Packcloth lining. Slip-Not, non-slip fabric. 4 to 6 ounce leather. #9 Heavy Duty YKK Zippers. Taped and double stitched seams. Reinforced stress points. Nylon webbing. Polypropylene trim webbing. High-strength Duraflex and Fastex hardware. Height – 11-1/2"; Width – 9-1/2"; Depth – 3-3/4"